ResponsAbility challenges conventional thinking about our governance and legal frameworks. The cross-currents of persisting, established worldviews, knowledge systems, institutions, law and forms of governance are now at odds with future-facing innovations designed to help societies transition to both low-carbon economies and social equity. This book explores the ways in which we can move to new governance and legal structures that more effectively reflect our changed relationship with the Earth in the Anthropocene. The book is written by a group of eminent scholars and leading experts from a diverse range of backgrounds, all of whom bring new knowledge and analysis from across oceanic and continental regions. Many are from the discipline of law, whilst others bring expertise on indigenous knowledge, climate, water, governance and philosophy to engage with law. Contributors include His Highness Tui Atua Tupua Tamasese Ta’isi Efi, Head of State of Samoa, Judge Sir E. Taikakurei Durie, Dame Anne Salmond, Pierre Calame and Adrian Macey. 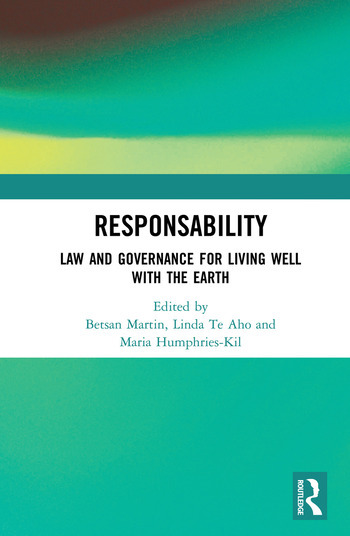 A number of scenarios are presented throughout the book for the realignment of global and local law to institutionalise responsibility for social, environmental and earth-centered equity. Betsan Martin is a founding member and Executive Chair of the International Alliance for Responsible and Sustainable Societies, an inspirational think tank and resource centre working with responsibility as a framework for 21st-century issues. Betsan had a leading role in establishing the UNU Centre of Expertise in Education for Sustainable Development at the University of Waikato. She is active with the global network of UNU Centres of Expertise. Betsan’s academic research in philosophy of education specialized in an ethics of responsibility, which informs themes in her work in integrating social, environmental and economic areas. Publications include focus on water governance, responsibility and ethics, education for sustainability, and responsibility in law. Linda Te Aho is of Waikato-Tainui descent and serves on the tribal executive committee, Te Arataura, and as a director of the commercial entity Tainui Group Holdings Ltd. An Associate Professor in Law, Linda's research focuses on contemporary issues in Law and Governance, with a particular interest in Indigenous Peoples’ rights and responsibilities in relation to land and freshwater issues. Linda was the founding director of the Maori and Indigenous Governance Centre at the University of Waikato and provides legal and strategic advice to both Maori and the Crown in relation to negotiated Treaty Settlements and law reform. Linda served as a guardian under the Waikato River Settlement and is currently the editor of the Waikato Law Review. Maria Humphries-Kil has academic and research interests in Management Education. She is a co-author of the textbook: Understanding Management Critically (2014). Informing this publication are over 50 academic papers, and many conference contributions.